I've read on the forums at get rich slowly about 'gifts of equity' which is a term I've only found used in the states. My understanding is that a gift of equity is a unique way of coming up with a down payment for a home. Basically there is a sale between family members where the current value of the home is listed as well as the price they are selling it for in the sales agreement. The difference between those two numbers is considered a 'gift of equity'. That 'gift of equity' can be used (in the sates) as their down payment on the home. I have posted this questions on the aforementioned Get Rich Slowly Forums, and also shot it off to Gail Vaz-Oxlade. I will let you know if I get any good information from either of those sources. I did call my bank, they had no clue what I was talking about. I also shot off this question to a couple of mortgage brokers, and got a few responses. Unfortunately, Canadian law requires all mortgages to have a down payment. There is no recognition of an 'equity down payment' by way of a gift or otherwise. I completely understand where you are going - however our current lending laws don't provide us any options. I find it absolutely flabbargasting that I would have two answers that are completely opposite. Is anyone out there familiar with it? I will be credit card debt free in 4 days! I read Money Funk's post, about 28 ways to make more money, this morning and got an idea. I'm going to look into becoming an Avon Lady. There's none that are active in my neighborhood, so there wouldn't be any significant competition. How do I know that? I've lived in my current home for nearly three years, and an Avon sales rep (let alone any other door-to-door sales rep) has not yet come knocking. I don't really know how it would work, but I went to their Canadian website and sent away for some information. My Great Aunt (who lives in another part of the city) has an Avon lady, so I'm going to see if I can talk to her about it. See how much money making potential their really is. I'll let you folks know more about it, as I learn about it too. Has anyone out there ever done this, or something like it, before? I will be credit card debt free in 7 days! A Comparison - How Much Do Your Groceries Cost? On my lunch break the other day, I was cruising the local news websites and came across an interesting report. CTV Calgary issues a grocery price comparison report each month! I was fascinated to read it because my brother and I recently had a conversation about how much groceries cost. He shops primarily at Co-op and the farmer's market. I think that he's pretty aware about the costs of things and believed it when he told me Co-op was one of the cheaper grocery stores in town. Well, that's simply not true - based on CTV Calgary's report. For an example of the report, the monthly article is here. I went through each article from January, 2009 through to August, 2009 and created an excel spreadsheet of the results. Co-op is THE MOST EXPENSIVE STORE! What?! Superstore was the least expensive, which is acutally not that suprising. The average discrepency between the most and least expensive stores was $51.78. Over the course of the year, that could wind up costing you over $600! Wow! Now, Superstore is very overwhelming and it has been mentioned by my brother and Lindsay that they choose not to go to Superstore (knowing it's usually cheaper) because you usually wind up spending/buying more items then you had intended. I beleive that could be said about any store if you don't have a list, but i certainly agree that it is a huge store and very overwhelming at times. So, thanks CTV for doing a price shopping comparison for me! Now I don't have to. I'm definatly going to try sticking to Superstore, and if, not Safeway it is! When I started reading I thought that Safeway would be the most expensive. Did any of this suprise you? I will be credit card debt free in 8 days! Today is Jordan's pay day! Hurrah! Check out the house fund tracking bar, it's steadily creeping upwards. ..there were a few others that got me thinking but I can't seem to find them just now. I'm not pregnant, nor do I plan to be for at least a few more years, but I do think it's an interesting topic and one best discussed between partners. If I can afford to stay at home with kids, I would like to. My mom spent a number of years at home with my brother and I and slowly re-entered the work force as we went to school. I think we benefited HUGELY (oh yeah, i capped that) by having her at home. I know that even now we have a very strong relationship (she even reads this blog, which a few people have noticed, hi mom!) and I credit that, in part, to the foundation that was built while I was small. I found a calculator on todaysparents.com that calculates if it is financially viable for a parent to stay at home. I don't know if this is complete but it seems to capture everything. According to this calculator, I would be able to bring home about $20,000 with my current salary and current costs (for child care, i guessed using the rates from the child care program we have through work). If you're a parent - did you stay at home with kids or did you work? How did you make the decision? If you are not yet a parent and want to be - have you decided if mom or dad will stay with kids, do you want to work or stay at home? I will be credit card debt free in 9 days! Does anyone out there have one that you would recommend? WOW! I'm so pumped, it's rediculous. Only one more pay period and I'll be credit card debt free!!! Just two more little itty bitty payments (okay not so little, but STILL!!). I feel like a little kid, so excited! I will be credit card debt free in 10 days! So for the last 3 weeks Jordan and I have been at my aunts every Saturday and most Sundays doing yard work. 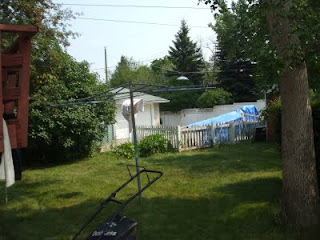 There's some things that we help out each week (like mowing the lawn) but we've been working on a fairly large project. We cut back her out of control hedges which were a little horror film (about 7 feet tall) to about 3 feet tall. It was a large time commitment, but we really didn't mind the work. I enjoyed being outside and spending some time with her - and it's not as though we had other plans. It sure has kept me from spending as much money on the weekends. Yesterday we stopped by with some new bins to keep her bird seed in (the squirrels were getting into her old ones) - and she had a cheque for us for $250!!! What?! yeah! She said she'd have to pay someone to do the work if we didn't and she thought it was fair. She said she'd continue to pay us for mowing the lawn and for any other big jobs that we help her out with. The deal with this is, that the money has to go into our house fund. Jordan and I are both fine with that. I made the transfer this morning, and our house fund is now sitting at $4,412.54 which is 35.3% of our Tier one goal! I have a LOT of RRSP contribution room, well, I think it's a lot. My 2009 limit is $13, 116. Now while I wouldn't borrow the full amount - I wonder about the advantages of 'catching up' when it comes to RRSPs. I read an article on CanadianParents.com, called Borrowing to Contribute which was written by Gail Vaz-Oxlade - and she supports it, big time! In reading the article, it would seem that the benefit does outweigh the interest you would pay. This is of course, only if you pay off the debt within one year and re-invest/pay off the RRSP loan with any refund you receive. The latest I will start my Company Pension Plan in October, 2010, though I'm going to try to negotiate starting this in October, 2009. It becomes vested two years after I start, which means two years after I start, the company cannot take back the money they've contributed. I want to be 'caught up' within the next couple of years or so, to really start taking advantage of compound interest. I don't want to wait until my company pension plan kicks in (due to so many variables) to start seriously contributing. Have you ever borrowed to contribute? What was your experience with that? I will be credit card debt free in 11 days! I recently started using google analytics to track the traffic on my blog, to my surprise I now have access to so much information about the folks that visit my small piece of the pf blogging world. I thought this was the perfect picture for Sunday! 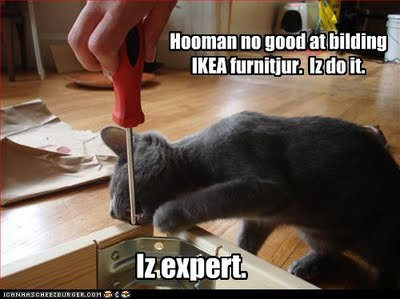 I think Jordan and I might take a trip to ikea, or at the very least check out kijiji.ca for some new/used furniture. He's sooo tired of our very used, very tired couches and chairs (which were free by the way). I doubt we'll spend any $$ today on furniture, but it's nice to look and see what the options are so we can plan for it. I will be credit card debt free in 12 days! I actually netted about $50 more then I thought I would too - which is pretty fantastic! I have updated all of my side bars, including my networth to reflect all the savings/debt repayments. If you check out my networth (about half way down on the right), you'll see that my networth is now ($62), I'm allllmost postive!! I have $300 for my jars, which is what i gave myself last pay period. It's tight, but it will work! I will be credit card debt free in 13 days! In particular, when doing up my revised budget yesterday, something occurred to me. I've arbitrarily decided I would like to save up $500 for Christmas spending, but realistically I will spend WAYYYY more. Last year, I spent over $1,200 on gifts and over $600 on decorations. YIKES! How will I spend less on Christmas gifts!? There are so many people that I exchange with....Last year, I really really tried (two really's, that means it's true) to be thoughtful and considerate with my gift giving - not just super spendy. I think I achieved that, but I was ALSO super spendy. This year I want to try to be thoughtful without breaking the bank. I clearly will need to put some extra $$ towards Christmas. How many people are you shopping for this year? What's your budget? So thanks to my mom who used my ING referral code. I scored $25 free this morning! I've moved it into my E-fund and updated the side bar! It is time, i beleive, to review my budget and go about updating it now that the credit card will be paid off in full in a few weeks. If I save $50 bi-weekly starting September 4th I will have $450 saved by Christmas, so I have set up this auto-debit already. I think this will work just fine. I will also make a few extra deposits into this account to plump it up for this years shopping. Next year, I'll have a big fat pile for Christmas! This is one fund that I intend to always put funds in, and always use. I think $50/bi-weekly is pretty reasonable - do you? I have also set this account to start bi-weekly deposits of $50. That will put me in the $600 range by the end of the year. This account will also need some extra help to reach my goal. Which again, I beleive I can do. I have set up my RRSP accounts to start auto-debiting $50/biweekly (see a trend?) and this will have me reach my goal by the end of the year! I will consider ramping up my RRSP savings next year, we'll see. At this time, I am going to nix the future fund before I've started it. I've been living super super strict the last little while, and i'd like to build some flexibility into my budget. The timeline for buying a home has potentially moved up to about two years from now rather then 4 or 5 years from now, so next year (which is only 4 months away!!!) I will likely ramp up savings in this area instead. You can see that there is an excess of about $300 each month. Some months this will be more and some months less (b/c I go bi-weekly which makes more sense for me). When I have larger surpluses I will siphon some to the Efund and some to the Christmas fund to bolster them for the end of the year. I will be credit card debt free in 15 days! 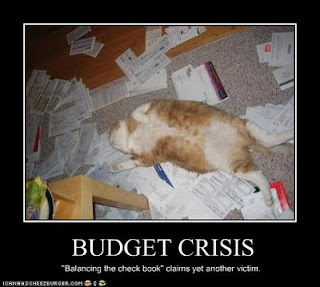 Now that my credit card will be paid off in two weeks.....I need to...Review budget, define priorities, make a plan, stick to it! As some of you folks know, I recently cut up my credit card so as not to be tempted to use it while I was clearing up that pile of debt. Due to the general day to day need to have a credit card, and the want to keep my credit history that is associated with that card active - I've decided which card to use going forward. Thanks to everyone who left some tips/advise on which cards you use. I've decided to go with the CIBC Dividend Card (visa). There's a couple reasons I went with that guy. I needed to stay with a card that CIBC offers to be able to switch my current card and the new one while maintaining my credit history. "on net purchases you make with your card. Your rebates will be accumulated and the money saved will be credited to your card account, when the December statement is issued." - You earn 0.25% on the first $1,500 spent, then you earn 0.50% on the next $1,500 you spend, then you earn 1.00% after that. I'll look into all the little explanations for each of those, but I highly doubt I would take advantage of any of it. The card will come sometime in the next two weeks, and the pin and access information will come the week after. So, in theory, I won't receive it until after everything is cleared up. Well, it's actually been two weeks since Starlight (my horse) has moved to Calgary. I thought I would do a summary post in terms of where I stand when it comes to what I thought I would spend on her in the first month. Vaccinations were just about spot on. I still have one to give her (it's basically a nasal spray which will be awkward and she'll hate me for) and the other is a booster shot to one of the injections I already gave her. The pregancy test is probably a nix b/c a recently gelded gelding (boy horse who has been 'cut') mounted her and he probably wouldn't have done that unless she was in heat (smelled good and was ripe for the picking). I will probably still get her tested in a month if she starts to show. My cousin did take the $50 I offered to help with the gas in moving her to Alberta which I was expecting but hoping he wouldn't. The place where I am boarding her actually gave me a discount for the month of August because she wasn't there for the first three days of it. That was pretty awesome! The few items i NEEDED tack wise, didn't cost as much as I thought they would and I can still wear my old riding boots althought I would really really like a new pair of ropers (riding boots that lace up, not traditional cowboy boots). I've only had to bump my gas budget up by about $15 ( I think ) to compensate for the extra driving around. So this is also good news. Unfortunatly, my cinch is an inch or two too large so I thought I would have to buy a new one ($75 ish)...however; as it turns out someone i know as a leather hole puncher (that he leant me)! Heeyah! That means, I can just fix the piece of leather that the cinch (think of it as a belt for a horse) connects to the body of the saddle with. This is excellent because it means I won't have to buy a cinch or a leather hole puncher! There is a rivet missing from my saddle which means I can't use the breast plate until that is fixed. It's something that my dad figures is really important, but starlight has never been a bucker so I'm not too worried about it. So there you have it - my first month with Star. Going forward, the only ongoing fixed cost will be her month board/feed which will range between $90-$165 month depending on how much hay is required for feed. *Much appologies if there was too much horse-related language in there... feel free to ask questions if your interested. 17 days until I am credit card debt free! Hizzah! Jordan gave me the $100 for his brother's birthday present a few other small things, and it has been put towards my visa. 18 days until I am credit card debt free!! I asked Jordan for a post idea the other day and he said I should write about Hobbies, I kind of laughed it off because I couldn't really see the personal finance angle. I've been thinking about it the last week or two, and really, what doesn't have a PF angle? At this point, I'm not sure how much my hobbies cost, but wow! That seems like a big list. 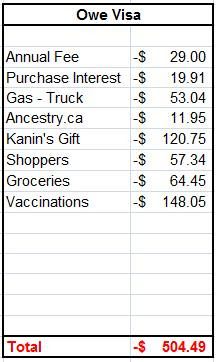 Some of the items above are free, some had large initial outlays however now wouldn't cost a lot (like camping & fishing). Some have fixed reoccurring costs (horse board), some have variable reoccurring costs (fish food ect). Do you know how much your hobbies cost? What are your hobbies? I've been thinking that sometime in a couple of months, I will consider getting a new credit card. I would like to have it for the odd time where you need credit to rent a car, or hotel room or other such thing. I also realized (today) that I need a credit card to get my credit score online which I like to do once a year or so. I'm wondering if I should look for one with low interest, no annual fee, points, cash back, bonus', reward miles... ect. I'm wondering how people in the pf word have chosen which credit product they use? Home Ownership - A possibility? I few months ago I wrote about buying/renovating my Aunts place, this is still something we talk about every day. We spend a lot of time at her place taking care of the yard and doing other miscellanious things that she can no longer do for herself, and we also spend a lot of time at home depot and open houses trying to get ideas about what we would want to do with the place and how much it would cost. Her place would need a total renovation if not restructure. 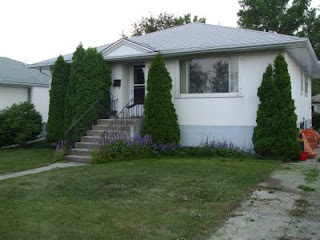 In the 30 years that she has lived there the ONLY maintance was a new roof a few years ago. She and her recently passed husband also chain smoke(d). We're thinking of approaching some design students to see if we can get some ideas on what to do with the place. At this point we're not sure the best plan of attack, or if we should just figure it out ourselves (or try to?). In my head I know that we should not get too excited about it because it could be a long way off, but it may also not be.... let me explain. She has told us that she want's to have AT LEAST one more Christmas in the house... well, Christmas is 4.5 months away. We don't know really what her plans are (I doubt she knows)... I've read about a lot of different ways you can mortgage a place or buy property off family, but again I don't know how she would want to do all of this. Part of me hopes that she takes the next 3-5 years before she moves, but the part of me that really really really really wants to own a home and have a back yard.... wants her to decide sooner. It can be pretty overwhelming even to think about, let alone write about, so I'll stop here. I will show you some pictures though! The front of the house is on the left the back of the house and a view of the garden is on the right. There is a garage further to the rigt that you can't see. There is also a large deck that you can just see the corner of on the left hand side of the right picture. A huge thank you to stackingpennies who pointed out the partial RSS Feeds are not preferred! I have just changed my RSS feed to 'Full'. Jordan and I don't really have a date night, but we had a date last night! I think we ought to make it a regular thing. It was a lot of fun! I got a $50 gift certificate from Milestones, a pretty nice restaurant, from someone at work yesterday (who was just thanking me for being awesome while she was sick and away from work)... So we took that $50 gift card and another $36.50 (tip and a bottle of wine) and had ourselves a 3 course meal! It was fun because I got to surprise Jordan with it, and we've been Soooo Frugal lately so it was a good treat! I like date night (hint, hint). 2. WE JUST BROKE THROUGH $4,000 ON OUR HOUSE FUND! YEAH! 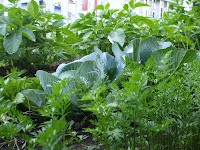 A while back I wrote about the garden Jordan and I planted at my Aunts place. 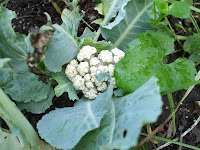 I'm pleased to say that everything is growing like mad!! 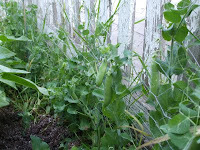 The peas are ready to eat (though I'm going to let them plump up a bit) and there will be more soon! 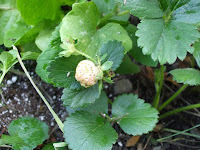 Some Strawberries are coming in too! 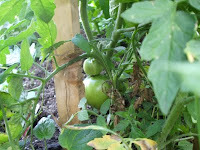 One plant has 5 tomatoes! I spent my lunch hour looking at my bi-weekly budgets from now until the first week of January, 2010 and I beleive the following to be some pretty solid goals that I can acheive. When I started this blog back in January, 2009 I listed my goals here. I beleive that I have acheived my first goal which was to become less neurotic about my finances. By no means am I completely calm and stress free at this point, but I have certainly come a long way. This blog, and the discovery of so many other personal finance blogs, has been an amazing resource for me. My second short term goal for 2009 was to pay off my credit card, as you know, I should be there within the next four weeks. Not too long ago while visiting my mom, she mentioned that if she were my age she would be saving for Laser Eye Surgery.... In thinking about this I did a little googling to see what options there are in my city. Has anyone either considered or received laser eye surgery? Was it worth it? My benefits at work will be $250 every two years towards the cost of the surgery. Every two years, I can re-submit the same claim until it is completly paid for. So I would have an upfront cost, and then receive paymetn as long as I stayed with my company. As I'm sure a lot of you know (I'll just pretend that I lot of people read this), I've been working to put a lot of overtime in at work. My original goal was to have 75 hours banked by August 7, 2009. I came pretty darn close. I requested a 30 hour payout on July 24, 2009; and I have requested a payout of 21.75 hours for my next pay period. I was able to bank a total of 51.75 hours in about a months time. That's pretty great I'd say. It helped me put (or will when I get paid out for the second portion) upwards of $600 towards my credit card debt. Any overtime that I complete now would not be paid out during the next four weeks which is past my debt repayment goal. That said, I do have some more OT on the horizen. I was approved for another week or so of OT within my group (I'm thinking maybe 1o - 15 hours tops), and there may be another group that needs some administrative help after hours as well. This was a fantastic way to move my debt repayment schedule ahead, and I would reccomend it for anyone who is in a position to do so. 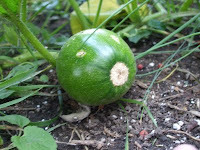 Just a quick post to thank Frugal Dreamer for commenting on my post today. She directed me a post she did a while back (The Story of Stuff). She links to a you tube video that explains the consumption cycle - it is absolutely fascinating. I strongly encourage you to view it. The video itself is about 20 minutes long. Lindsay posted a comment about The Story of Stuff on her blog as well. My Brother made a related post about consumer ethics. When it comes to bugeting, whether we use the magic jars, excel spreadsheets, or even just vague guidlines, we generally try to keep ourselves within certain limits for certain spending categories. For my clothing budget, I have it set pretty low. Clothes arn't high on my list of priorities so I often shop at discount stores, the clearance racks, and generally speaking, lower quality stores. I wonder, what do we sacrifice when it comes to saving money? My roommate, Lindsay, recently posted on her blog about the choices we make when purchasing clothes. She makes references to some clothing company's that take advantage of sweat shops, which often have the cheaper clothes. Not just cheaper with regards to price, also quality. Then there are clothing stores that over sexualize women in their efforts to market clothing. There is one particular store that she mentions which requires the submission of photographs simply to work there. She also mentioned to me in a converstion we had about her post that the founder of said company was charged with several sexual harrassment cases. However; their clothes are of much higher quality! So, are you aware of the choices you make when purchasing clothes (among the other purchases we make every day)? Are we supporting sweat shops? Sexual harrassment? What else are we compromising, what other costs are associated with the items we buy other then just the dollar amount on the price tag? Thanks for posting this intriguiging post Lindsay! In efforts to stick to the magic jars and pay off my credit card, while avoiding another epic jar fail, I've decided to actually cut up my credit card. This is a big deal for me. My credit card is my crutch, it's my emergency fund, my I want it fund, it's my I didn't budget for enough groceries and I'm hungry fund. My credit card, is the only thing holding me back from being super happy with my finances. I am not willing to let it and my constant use of it to control me, my finances, and my state of happy any more. So, bye - bye credit card. I actually cut it up on Friday so that I couldn't use it at all this weekend. I feel, well, I'd love to say that I feel good about it. At this point I'm sort of neutral. We'lll see if this helps stick to the plan. Here is an update to my credit card debt repayment progress. My original plan was posted here. 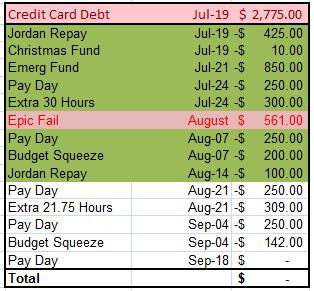 It has gone through some significant morphing; however, I am still on track to have that card paid off completely by the first week of September. Wow, that's only 4 weeks away. 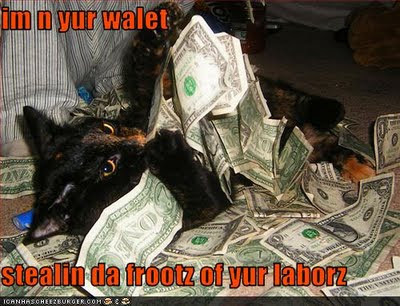 It's that time again, payday! Thank you again to everyone who gave feedback on my epic jar fail. I've decided to not pay myself back the full amount I spent on my visa, and instead continue to work the jars. Yes, there is about $230 dollars left over, that is because our utility bill for enmax doesn't come out this time until the 24th. I need this money (part of my roomates share and mine) to carry over to pay for the bill in the next pay period. I have about $30 carrying over from last pay period. This is in part becase my horse board was $84 not $90 for this month as well as a few other small things. You can also probably see that I've managed to squeeze an extra $200 out of my pay to cover 2/5 of my visa spending last month. Looking forward, I have about $100 I can use next pay period as well. I am hoping that when Jordan gets paid next week, he will join me in using the jars. I don't (at this point) thing it's necessary to combine EVERYTHING, however; I think starting with the 'food jar' would be the perfect place to try using the jars together. He will also probably be giving me an extra $100 or so to cover half of Kanin's gift ($60) and some other odds and ends that I picked up (some of the shoppers drug mart expenditures, and gas for his truck). If he's got room to do that, that $$ will go straight to my Visa. All in all, I'm looking forward to staying on track and having a successful next couple of weeks. Benefits @ Work = Shoes? I have traditionally had quite a difficult time when it comes to finding shoes. I have very high arches and heals/flats are usually uncomfortable. My mom suggested I look into my benefits at work to see if there might be any options. Well, apparently there are some options! “We will cover 100 per cent of reasonable and customary costs (unless specified otherwise) for the medical services listed below when ordered by a doctor." for custom built orthopaedic shoes, the charge, reduced by the cost ($50) of ordinary shoes, and orthopaedic modifications to shoes, provided such shoes and modifications are recommended and approved by a licensed physician or by a licensed podiatrist. orthotics (custom made inserts or arch supports) - all such claims will require to be accompanied by a medical statement outlining the reasons for supporting the expenses. Reimbursement will also be limited to $300 for all such claims, per calendar year. I can also receive reimbursement of up to $40 (max 20 visits) to a podiatrist. So with all of that in mind, I’m going to see if my doctor (so I can meet the ordered by a dr. requirement) will recommend a podiatrist or orthopaedic doctor to see if I could get some custom made inserts/ach supports. That would be pretty cool. Then, I wouldn’t have to buy new shoes, I could wear the ones I have, comfortably. Well, I have finally caved. I signed up for swagbucks to see what the fuss is all about. You earn redeemable points when you search the web, have referrals, shop online (via their links) ect. I know that Dinah just signed up and isn't having much luck yet, but that Krystal over at Give Me Back My Five Bucks is having a lot of success. If you are interested in signing up, please use my referral link. I have good news on two fronts. 1. My landlord has asked me to mow the lawn of her neighboring rental property. She'll give me $60/month until she finds new tenents. 2. One of the other divisions in my company is behind on their filing and would like some help. I have been asked if I would put in the OT to help them out. I'm thinking of saying yes, but given that this division, is not mine, I don't want to lose the 2.5 hours each week. If they will let me clock an extra 2.5 hrs so I don't 'lose' it; then I'll say yes. I'm not really excited about more overtime because I'd like to be spending that time out with my horse, but a couple days a week wouldn't hurt me. So far, those are the only leads I have to make up for my 'Epic Jar Fail'. A few weeks (?) ago, I mentioned that I would be moving my horse, Starlight, back to within driving distance. In my post Weekend Spending Forcast, Manshu, from OneMint mentioned that he (I'm assuming, Manshu might be a she) would like to read a post about Starlight. So here it is. When I was 11, I started asking my dad for a horse. He told me no for a full year. "Jessie" he said, "We are just not horse people". The following summer, after my 12th birthday, I asked my dad again if I could have a horse. This time, he said yes! I was so surprised! I started scouring newspapers and asking around town about who might have a horse for me. I thought a horse might cost me a few thousand dollars, and had as much saved up for her. As it turned out, a friend of the family (my grandmother's, brothers friend) had a young quarter horse with no home. The horse was originally intended as a gift for his neice (? ); however the family did not want her. When my grandmother mentioned to him that her grandaughter (me) was looking for my first horse - he gave her to me. I could not ride her for the first year (no one should rise a horse before the age of three due to the development of their bodies/bones), but I brushed her and saw her nearly every weekend. The following summer, I finally got to ride her! By the time I was finished highschool my family had as many as four horses! Right under my dad's nose, we had all become, horse people. I went off to college, and Starlight had to stay behind. There was no room, and no money to bring her to the big city. For the past six years, we have tried to find ways to bring her to me or me to her - but it just hasn't worked out, until now. My parents slowly got rid of their horses as their interests and lifestyles changed. For the last year, Starlight has lived with my aunt/uncle in Southern BC. They have also made some changes, and no longer had room for her. It is wound up being, perfect timing. I am in a place in my life where I can afford the time, and the money to have her with me again. I want to be able to ride again and am so excited for that. So now, at 25 (me) and 15 (starlight) we are back together again! I am mildly saddend by the epic fail I experienced this weekend. The jars kept me on track for the first week, and I was loving it. Unforutnatly, this weekend - I wound up using my credit card more then I should have. I am not giving up on the jars as a concept, however, to dig myself out of this - I see two options. I'm going to have zero variable spending after I get paid on August 7th, which means no Jar Money in order to pay myself back first. This hurts in a couple of different ways. It means if I have to buy groceries (or gas, which I do) it will have to go on my credit card. *sigh. I could continue to use the jars, as planned, & not pay myself back for this weekends issues. I think Jordan would probably support this idea the most. I can add another two weeks to my debt repayment schedule, or find a way to make more money so I still meet my goal. If I do this, then I can continue to try not to use my visa, rather then setting myself up to have to use it and then feeling guilty over it. I'll go over each line item. 1. Annual Fee, I completely forgot about when this would be happening, and didn't budget for it. I pay the $29/annual to get an interest rate of 11% rather then 19%. 2. Interest. Lame. Also, not planned for. 3. Gas for Jordan's truck, we drove to Golden to pick up my saddle and what not - only fair that I pay for at least half of the gas. 4. Ancestry.ca - i'm clinging to this online subscription (I cancelled two others, and downgraded this a while back). Researching my family tree is a huge interest for me, and this really helps. 5. Kanin's gift - Jordan's little brother's bday, and neither jordan or I saved enough to cover it. Jordan is going to give me some cash for this in a couple weeks when he gets paid. 7. Groceries, Jordan bought half, and this is my half. Only it was more then the cash I had left. 8. 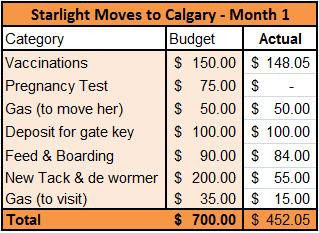 Vaccinations for starlight, I didn't realize when I was budgeting that she would need a booster ( a second shot) for one of them, which brought the cost up more then I thought. What did I do to save money? I'm giving starlight the shots myself (just muscle injections) which saves me about the cost of the injections themselves. We got some lunch food, when grocery shopping, so I won't need to buy any lunches at work this week. I spent $70 in cash, to cover some clothes that went about the $200 my mom gave me. I was seriously in desperation of new clothes. I probably won't need to buy again for several several months. Not that this was my only problem, but it upset the rest of my alocated 'jar money'. So, do you think I should just cut all spending for the next pay periods 'jar money' and use that to pay off the overspending on my credit card, or; should I continue with the jars and try harder to limit my overspending?